Find hotel near Ermita Mare De Deu De Les .. 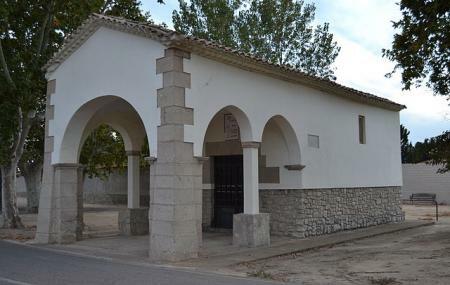 The Ermita Mare De Deu De Les Sogues in the municipality of Bellvis is a sacred chapel included in the Inventory of the Architectural Heritage of Catalonia. This chapel was built with the help of all the neighbors of Bellvis and some from the surrounding villages. The chapel suffered a huge setback during the 18th century when they were fighting for their independence. The people of Bellvis have safeguarded this place and they will continue to do so owing to the tough times that this sacred place has withstood. Try the best BellvÃÃƒÂ­s trip planner to visit this Ermita Mare De Deu De Les Sogues as well as many others. Fine Accommodation options like Hostal Can Jaume, Hotel Salat Resort and Hotel JardÃÃƒÂ­ Apartaments will meet your requirement of where to stay in BellvÃÃƒÂ­s. If you want to add the visit to Ermita Mare De Deu De Les Sogues in your trip, you can choose from the variety of BellvÃÃƒÂ­s vacation packages that can be designed to suit your preferences. These packages also cover your major concern of how to reach BellvÃÃƒÂ­s. Love this? Explore the entire list of places to visit in Bellvís before you plan your trip. Fancy a good night's sleep after a tiring day? Check out where to stay in Bellvís and book an accommodation of your choice.